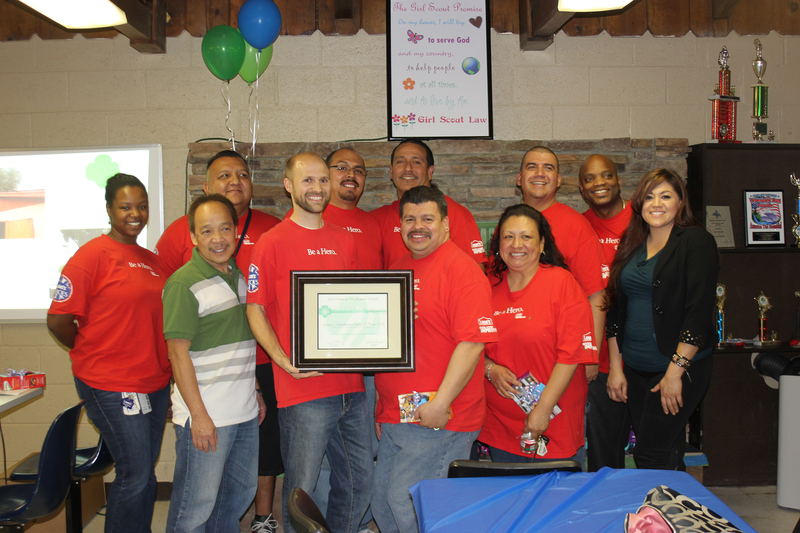 The Lowe’s Heroes who dedicated countless hours bringing happiness to local girls! The instant Katie Keys stepped through the doors of the small structure she was moved by memories of her girlhood. 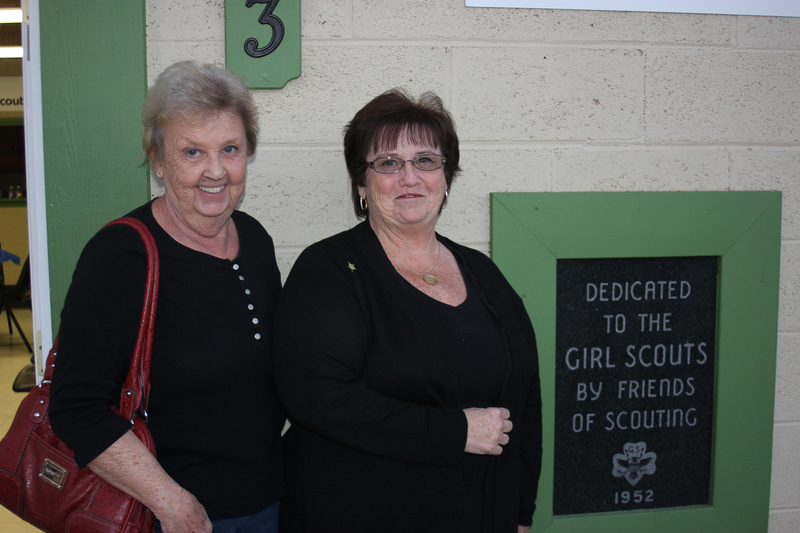 The active Perris community member was a Girl Scout here until 1960, still a proud alumna of Troop 4, and a member of the very first group of girls to use the Perris Scout House back in 1952. “I was here for the first opening and here again to see it restored in beauty,” said Ms. Keys during the March 6 rededication ceremony of the Perris Scout House. She wasn’t alone. 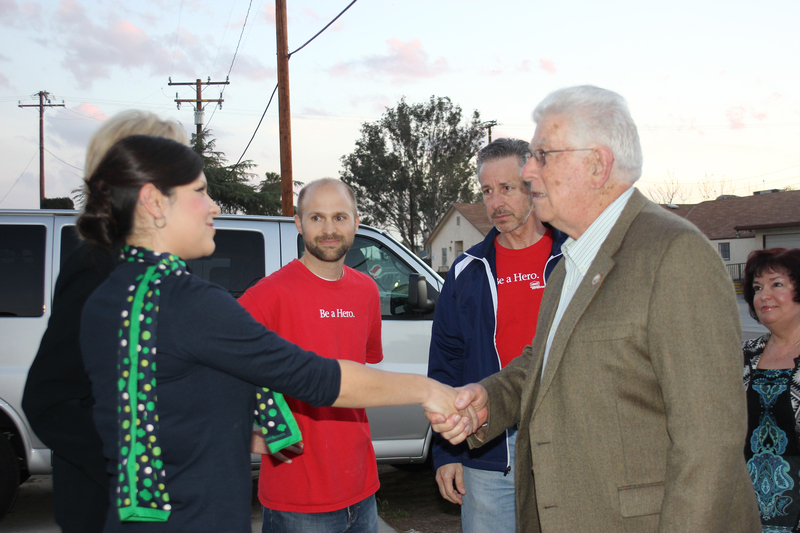 Over 60 proud community members were in attendance, including Perris Mayor Daryl Busch. Katie Keys and a life-long Girl Scout friend. “I am awed at the sense of community and so incredibly proud of the work done here today,” said Mayor Busch. The scout house is owned by a family trust, which generously allowed Girl Scouts to use the facility over the years free of charge. Sometime after the 1990s, the structure became forgotten by the community, and the building fell into severe decline. The renovation required extensive work: the installation of two air-conditioning units; ceiling fans; a refurbished fireplace; rewiring of all electrical sockets; outdoor lighting; fresh paint; mended baseboards; construction of an archway and threshold, as well as resolution of countless other issues within the building. Who would invest the time, money and energy needed to bring it back to life? The answer, of course, was a fresh generation of Girl Scouts. Girl Scout Leader Patricia Campos shakes hands with Major Busch. Maggie Ramirez, an energetic Cadette from Girl Scout Troop 40782, lead by Patricia Campos and Janice Carroll, sent and email to Lowes, the local home improvement and building supply store, asking for assistance. Her letter landed in the inbox of Chris Dahl, project manager of Lowe’s Heroes. Upon seeing the pictures of the neglected building, Chris immediately knew this was the project for his team. The venture required 500 hours of work and the assistance of thirty volunteers. Lowe’s Home Improvement generously provided the funds to complete the project, as it has with many others around the country. The local store also donated all the needed supplies. When the project began to lose momentum, it was Girl Scout Maggie Ramirez who renewed the crew’s energy. She breathed new life into the tired volunteers with her genuine gratitude. Ashley Villatoro, representing Maggie Ramirze, shaking hands with Hero Chris. Girl Scouts of all ages will benefit. The thank you’s given to volunteers. Time and again, the girls were shown the true spirit of community. Harry Jimenez (sp), general manager for Lowe’s Distribution Center, came to help with the floor when he noticed the scout house needed all new appliances. Although Lowe’s had reached their project budget, Mr. Jimenez was able to make it happen for the girls. Nuevo Tree generously removed trees from the cluttered scout house yard and cleaned-up a huge tree directly next to the house. John May of the Forestry Department worked diligently to get the water running inside. Patricia Campos, Girl Scout leader of Troop 40728, designed the rededication ceremony while Ashley Villatoro, representing Maggie Ramirez, also from Troop 40782, gave her speech. Unfortunately, Ms. Ramirez was unable to attend; she is currently spending time with her grandmother in Mexico. The Heroes from Lowe’s were joined by the ladies of Troop 488 and Troop 40728, along with their families, who worked right beside them. 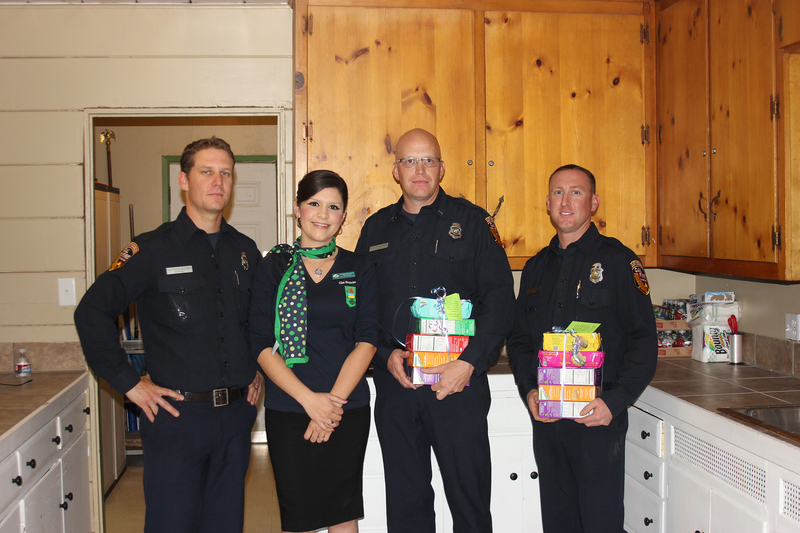 Patricia with local firemen who opened their doors to the girls during the renovations. “When I was scrubbing and cleaning I felt like I was part of something important and now, looking at the finished project, I see what a huge accomplishment this was,” said Ashley, a 13-year old Cadette. “Walking in the house all finished up makes me smile inside my heart,” said Savanna, a 7-year old Junior of Troop 488. During the remodel some treasures were uncovered: trophies from the 50s, 60s and 70s. They are now proudly displayed in a cabinet, waiting to be joined by future awards that new girls will earn. A local legacy is no longer in danger of being lost forever. Generations of Perris Girl Scouts have passed through these doors and now generations more will follow in their footsteps. There’s still work to be done! If you would like to donate your expertise in either area and volunteer to finish renovations, please contact the Girl Scouts of San Gorgonio Council at 951-813-3355. Next Next post: GOLD AWARD SPOTLIGHT: Summer’s “Kinder Garden” transforms one school’s landscape!